Thank you, Programme Director, ladies and gentlemen. May I express my gratitude for being afforded the opportunity to be one of the first people to express an opinion on the freshly ground work of the three ladies who have birthed an addition to the literary family of the Free State province. 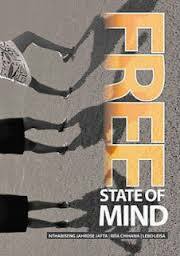 I am humbled to stand in front of the audience of this magnitude and say words that cannot be compared to the voice of reason in the book, Free State Of Mind. Thank you, Nthabiseng. Enkosi Rita. Ke a leboha, Lebo. As a literary critic, I am always guided by the literary theories so as to contextualize my appraisal. I must confess, after glossing through the book... which was handed to me only yesterday.... I could not immediately think of any particular theory. Because it is a book written by women one would be tempted to rush for the feminist approach. But one immediately thinks, is it not demeaning to say these are women, and they should think like women. Are we not retracing our steps that led to the emergence of the very theory to the exclusion of other aspects? I would rather look at it from the perspective of a Womanist literary theory. This is a term used by Alice Walker to describe a theory that looks at the perspectives and experiences of a black woman. Reading through this book one is confronted with strong words that, at times, suggest anger..., but, in the introduction Napo says, “I think the day the world stops to box ‘the black women writings’, or label it as angry ... more women will write and be in a ‘Free State Of Expression.’ ... To ensure that any writing by women take it’s deserved place in the literature of South Africa and the world I think we should heed Napo’s call. In the light of the above, I would, therefore, locate the writings of our three authors in a free state of mind, without undue conformity to any particular set of rules. I would also encourage whoever ventures a review of their work to be careful not to apply a single theory to the exclusion of others. Let me make an example of how any literary theory could be deployed to unearth the treasures hidden behind the words and phrases put together by Nthabiseng, Rita and Lebo. Russian Formalism would address the literariness in each poem where we see beautiful metaphors in the hands of these women-crafters. The opening line reads: I yearn like a coloured butterfly to fluff away in a song In this line we are afforded an opportunity to peep inside the mind and soul of the author, or I’ll say authors as this piece is co-authored, to see with our imaginative eyes the quest to break lose and be free spirited young women... free of all inhibitions and man made impediments. This is poetry. It comprises of two elements: What the poets want to communicate... and how they communicate it. And like a livewire this trend runs through this book setting every idea alive and brightening every dark corner with a metaphor. The night is short, Mr Programme Director. I would have, otherwise gone on to analyse each and every poem on the basis of the communicative devices that turn words into poetic lines and make these young women artists who, with the formless clay would create a structured work of art. Suffice to say, ladies and gentlemen, poetry is more difficult to write than any other genre because the literariness in poetry means the ability to handle language at different levels while not losing meaning and sense. As I stated earlier, the work cannot be seen from a Formalist point of view only. A cursory look at the book said to me all theories applied will unearth the formidable nature of the book, Free State of Mind as a work of art. We could look at it from the point of view of the Sociology of literature which is a branch of literature that examines the relationship between the literary works and their social contexts. This would assist to understand how the mind of a young woman perceives the world.... They are poets, but they are human beings also. This is what they say about men: Rita is 'jilted'; and she tell the man where to get off: Because he has the power to crumble my heart into pieces Just like all of these diseases Fatal and harmful I thought that he was cool Little did I know that he would stoop this low? Well, he does not want me anymore! Lebo is puzzled by men who do not make any move, and does not hesitate to tell them of their unmanly behaviour: Athe banna ba kae, banna ba motseng Banna ba ho ithoka bo? Senyamo se, se mpheta le hoja ke itlhatswitse Ke le dikonkosi Ha ho lekopokopo ho koposela, ke re metsi a pula ho lelemela Tjhe! Le ha ke le mobe ke le ya kgesehang Ha ho ya nthonakang?